It’s not easy being Dave Brat. Photo: Tom Williams/CQ-Roll Call,Inc. Dave Brat is stressed. 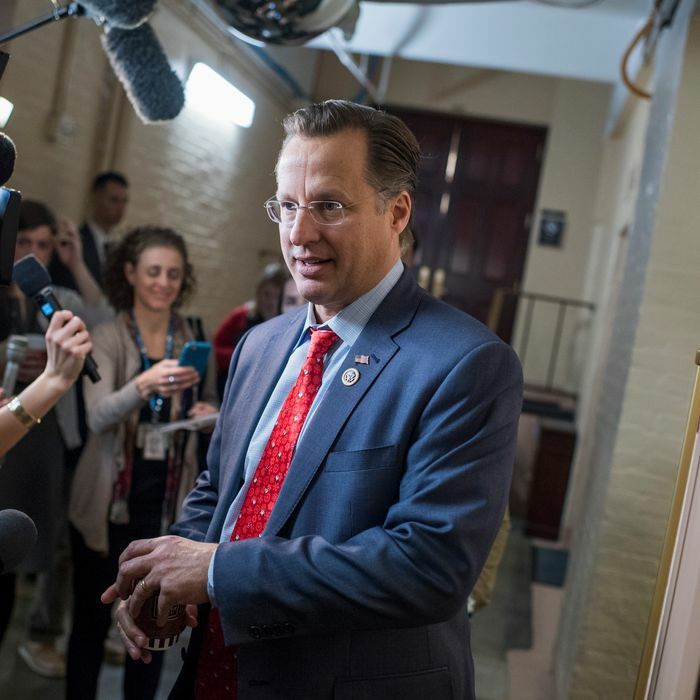 Four years after booting Eric Cantor from what seemed to be a safe seat in Congress, the Republican representative for Virginia’s Seventh Congressional District has entered troubled waters. Monmouth’s most recent poll places him in a dead heat with his Democratic challenger, Abigail Spanberger, who raised $3.6 million last quarter. During their first debate, Brat misrepresented The Washington Post’s rating of a Spanberger ad. According to Brat, Glenn Kessler of the Post’s Fact Checker column had given Spanberger four Pinocchios for an ad that attacked Brat for voting against protections for people with preexisting conditions. According to Kessler, The Fact Checker did no such thing. During the same debate, Brat brought up House Minority Leader Nancy Pelosi 21 times. Though Pelosi is assigned godlike powers by Republicans, who trumpet the alleged depravity of her liberalism every time they need to win a tight race, she’s not challenging Brat for office. Abigail Spanberger is, and she might just win. The inmates “have it hard,” Brat conceded. “You’ve got some fears, real anxieties coming up with a job,” he said. He urged the group’s members to find a support network, and to exercise, read books, and “go to the Bible” as a substitute for drug use. Brat had a different take on the interaction. It is perhaps not a surprise that Brat’s solutions are individual ones, emphasizing behavioral changes. Brat has disputed the notion that he is an Ayn Rand devotee, but as Zack Beauchamp reported for Vox in 2014, he clearly values Rand’s libertarian ideals while placing his own idiosyncratic spin on libertarianism. The representative, who has a master of divinity degree in theology from Princeton Theological Seminary and once taught economics at Randolph-Macon College, links economic growth to the spread of Protestantism — certainly not a new idea, but one Brat approaches with pronounced evangelical fervor. Binyamin Appelbaum detailed Brat’s views further in a 2014 piece for the New York Times. “If we all did the right thing and had the guts to spread the word, we would not need the government to backstop every action we take,” Brat wrote in an article for Interpretation: A Journal of Bible and Theology. As a congressman, Brat has an unparalleled opportunity to advance his peculiar meld of Protestant theology and Randian economics. But his constituents may have tired of him, and of the values he says he represents. Perhaps Brat’s previous appeal to voters was a product of anti-Establishment fervor rather than something more substantive. Brat now faces a humiliating possibility: He may be unable to replicate his astonishing victory. Not only could he lose his seat, he could lose a district Donald Trump won by six points two years ago, and in the process, push Virginia more comfortably into the arms of the Democratic Party. No wonder he’s come unmoored.